A mid-life crisis can be a frightening thing. Bruce Jenner is having one at the age of 65 and it’s one of the scariest things I’ve seen. 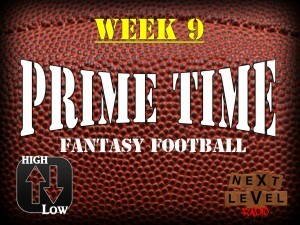 Thankfully, rather than having a mid-season crisis we’re plugging right along here at Prime Time Fantasy Football. During episode number 20 of Prime Time Fantasy Football Adam Gori, Joe Webster and I all talk about everything fantasy-relevant heading into Week 9. We kicked off this week with some more High/Low. We’ll discuss how poorly we did last week, but why we think some guys will bounce back this week in our “High” segment. We’ll also discuss what we think two Niners, three QBs and all sorts of running backs’ chances of performing well are this week. We followed that with some “Zero to Hero” and “Don’t Buy the Hype.” All running backs and wide receivers in these two segments, so if you’re one of the many owners struggling thanks to byes this week, this would be the portion of the program for you. I’ll also tell the story of an instance where my life flashed before my eyes. It happened yesterday. It was scarier than Bruce Jenner’s mid-life crisis. Trust me on this. Then we played America’s new favorite game, “Take Your Pick.” Will Ben Roethlisberger throw for 500 yards and 6 TDs again!? Well no. But will he have a better game than Joe Flacco? How about the game in Minnesota – will Alfred Morris or Jerick McKinnon have a better fantasy day? Which rookie wide out will play better tonight – Kelvin Benjamin or Brandin Cooks? We’ll give our opinions on that and more. Finally, the byes are rampant this week. We’ll offer some names that are solid pickups heading into Week 9 and beyond.